In Japan, the sworn brotherhood of the Yakuza is described as being "thicker than the blood of kindred brothers." 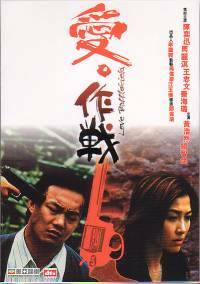 With his life under threat, disgraced Yakuza hard man Yamamoto escapes to Los Angeles in search of his half brother Ken, a small time drug dealer. Unable to speak the language and confused by his new surroundings, Yamamoto teams up with Ken and his friend and fellow gang member Denny. Soon Yamamoto finds himself back in the old routine. 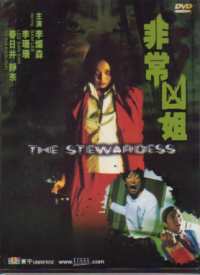 His ruthless efficiency in terrorising and killing rival gang members shocks even the blood hardened Americans and before long Yamamoto's gang is strong enough to join forces with a rival Japanese crime lord called Shirase. The gang is now too big to be ignored and they are quickly warned off by the mafia. 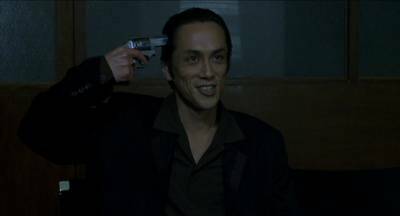 Yamamoto realises that there can be no turning back and as events draw towards their inevitable conclusion, the Yakuza learns that only Denny understands the ancient code of the "brotherhood". Takeshi Kitano is a highly acclaimed director and actor the world over, and despite not having made that many films, he has already managed to clearly develop his own style, so I've read. I freely admit that I have not seen many of his films yet, but all films which I have seen which he has been involved with have been violent films. With that in mind, it came as a little surprise to find out that he is also a well known comedian in Japan! Anyway, Brother also fits the bill of being a violent film, but what sets it aside from his other work, is that this was his first film to be largely set in America, and have a lot of spoken English. 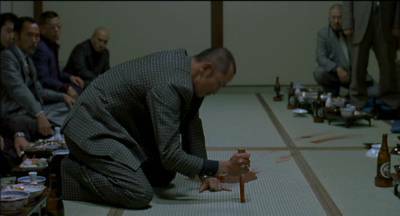 Kitano plays Yamamoto, a hardened Yakuza who is extremely loyal to his family. 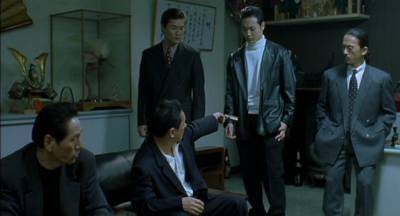 One night, though, a rival Yakuza family successfully kills their top man, and with the police involved it becomes clear that the only way forward is to disband the family. With this done, some of the members of Yamamoto's family switch and join the rival family. 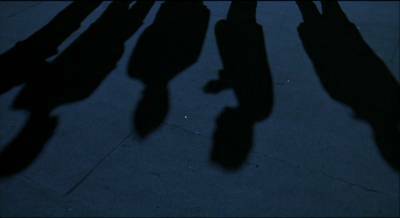 With their first task being to kill Yamamoto, they allow him to flee to America as they still have a lot of loyalty towards him. 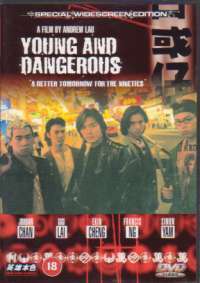 In America Yamamoto meets up with his half-brother Ken, who, along with a small group of friends, is a small time drug dealer. In a new country he takes a short time to adjust to the local customs, and longer to learn the language. It doesn't take him long, though, to learn of Ken and his friends' doings, as he witnesses Ken being beaten by the local Mexican gang's boss. To Yamamoto this is an outrage, and soon he falls back into his old ways of ruthlessness. He kills the Mexicans, and shows by example how Ken and his friends should be behaving. Over time their multi-cultural gang grows in size and power, which allows them to merge with another local Japanese ruled gang. The boss of this gang is Shirase, another ruthless Yakuza out for more and more power. With the gang growing to be very powerful, they are too big to be ignored by the bigger powers, the Italians - the mafia. When they come to blows, there can be only one conclusion, one side is going to lose. For me while the story was quite interesting to see how it panned out, there was nothing special about it which stopped it being predicatable. I found it was reasonably obvious what was going to happen, as there were no twists or turns in the plot, save one in the joining forces meeting with Shirase - I wasn't expecting that. With the way the characters were, I, most of the time, knew what they were going to do and be like. However, in a violent film, even though I pretty much what was coming next, I just hoped that the ride along the way would be satisfying. In the satisfaction department Brother definitely had its ups and downs. For violence, some scenes were very graphically violent. Blood was abundant, people were shot and killed without any glamour or style. This was good, as the lack of flamboyance in the gunplay did give the film a bit more of a realistic edge. A lot of the scenes though were only violent in imagery, as the actual violence was taking place off camera. You could hear the sound effects of what was going on, but you couldn't see anything. The camera would only come back for the aftermath. I get the impression this is a definite Kitano style thing. In some scenes I found it to be very effective (the attack on the Mafia mansion), but in a few others it didn't work quite as well. Anyway, action and violence wise, the film is good, and on the whole satisfying. My biggest complaint about Brother is the film's structure. 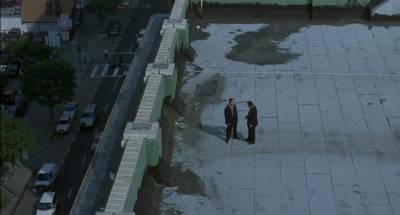 To me there seemed to be quite a number of scenes that while still making sense, are just put there. There wasn't a great amount of fluidity in the scenes, as things just seemed to happen. People were put in places, something happened, end of scene. Next scene some people, could be same people or different ones, are somewhere else, something happens, end of scene. For me it just made the film far too jumpy about, going from place to place. In some of the scenes the thing that happened wasn't really explained and the consequences of the action never appear to come about. For example, the noodle bar "death-by-chopsticks" scene. The guy doesn't say who sent him (granted you can guess), he is killed, and that is an end to that. I don't recall anything else happening as a result of that, which shouldn't have been the case. Performances wise, I'm pleased to say that I can judge some of the actor's acting properly as quite a few of the main actors were speaking english. I'll start with Takeshi Kitano though, probably because he is the toughest one to judge. He really is the master of the expressionless face acting school. 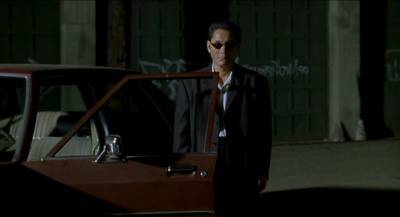 For this role as Yamamoto it really showed the "I don't give a f**k" and "I'm not phased by anything" attitude. Whether he is being threatened at gun point or not, he shows no emotion, which really makes him scary in some respects - especially if you are his enemy, as you won't know when he is about to kill you. There were a few moments of lighter relief with his character, mainly when he is gambling and joking around with Denny (Omar Epps). This shows the more human side of his character, and that he is not always a ruthless, killer Yakuza. Next up is Omar Epps. While I didn't think his performance was bad, I wasn't overly enamoured by it either. That may be partly the fault of the script-writers, as I did think his character really swore too much to make me like him... and you are meant to like him. For evidence of too much swearing, see his closing monologue. Don't think from that that I am a prude and don't abide swearing. Hell no, I swear as much and as often as most people, if not more often than average, but really gratuitous swearing does bother me (although I am guilty of that sometimes while drunk), and his character in some scenes is definitely guilty of this. That aside, Epps didn't make his character as likeable as he should have, but his performance was decent enough to keep the story working. Of the supporting cast you have Claude Maki as Ken. I didn't find anything special in his performance either. In some places it did seem like he was just coasting through the role, giving what each scene needed but nothing more that could make him stand out as a good actor. The other Japanese boss Shirase (Masaya Kato) was quite good. He came across as a bit of a psycho, which suited his character's actions and attitude. While he is definitely a character that you are not supposed to like, I did like the actor as he portrayed an even larger "don't give a f**k" attitude. Lastly, in a smaller role was Yamaoto's number 2, Kato (Susumu Terajima). He was another strange one, in some scenes I thought he did really well, especially the bonding scenes between him and the American gang member. Whereas other scenes I did find him quite annoying. The average for the acting, though, was decent enough. While I have moaned a bit about the scenes being jumpy, some of them were extremely well done. Many of them featured very long takes, which is something I quite like, as it shows the actors really have to know there role and what they are doing. They can't just shoot 15 seconds and then go away and read up on what the next 15s is going to require. The ones which I thought were done the best were the basketball scenes, mainly due to Kato. In the 3 on 3 (or was it 4 on 4?) match they have, I doubt they could have choreographed the whole thing as that would have been too difficult (I would imagine) as there would have been a lot of unpredictability in all of it. Despite this, each actor clearly knew what was expected from their character, and the whole thing came across as being exceptionally natural. I can't remember how long the take was, but I would guess in the order of a couple of minutes. The same goes for the scene where Kato is shooting at the basketball hoop with the American gang member helping him. 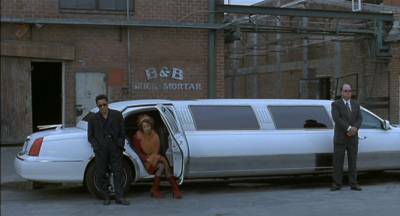 That scene also lasts for a good minute or two, and the banter going between the too, again, seems very natural, and for me those are two of the most memorable scenes from the film. As far as the film goes, they really aren't that important, but the way they are filmed and performed simply seems right. Brother, for me, is one of those films that once I've watched it, I'm glad I watched it, but I'm not likely to have the desire to do so again. That doesn't mean that I didn't enjoy the film, it is just that the flaws which I've previously mentioned ruin the overall power and repeat viewing factor of the film. I did enjoy it, and there are several scenes which I thought were excellent in their own right, but the flow of the film just isn't right. I don't know if that is a Takeshi Kitano style issue or not, but until I can get used to it, if it is, I've got a feeling that I'll be giving similar criticism to his other films, when I get round to seeing them. Regardless, it is definitely worth a watch, and this is the best version of the film that is available. The audio for Brother is a DD5.1 soundtrack in both Japanese and English. I've got to say that this is a pretty damn good 5.1 track. Throughout the film there are many discrete effects coming from the surround speakers, not just ambient effects spread around. Speech, car sounds, bullet noises, doors shutting, they all come from the correct direction relative to the way the camera is facing. It really immerses you in the film more when things like speech are coming from behind you, and someone on camera has a conversation with someone who sounds like they are really behind you! All sound effects were loud and clear, but there was a slight volume imbalance in my opinion. Some of the gun shots were very loud, and the speech that followed them was sometimes a little too quiet, Very small niggle that, and easily overlooked. Basically it is a very good 5.1 soundtrack. The English subtitles are forced when it is Japanese dialogue, but are optional for the English dialogue. I did not use them for the English speech, so cannot comment on them. The forced subs were very good. They were clear and perfectly legible. Maybe they could have done with a more prominent dark border around the letters, but I don't recall not being able to read them at any point. Spelling and grammar were perfect. A nice touch was that they didn't subtitle Japanese dialogue when the next line of speech was someone speaking in English translating what was just said. In instances like this, the person being spoken to in Japanese didn't have a clue what was being said, and not understanding Japanese I am in the same boat, so for me it was easier to relate to the person on screen who was also confused. So, like the audio, these are very good subtitles. With great audio and subtitles, Film Four kept things all on par with a really excellent transfer. One of my first thoughts when watching and seeing how good the print was, was that it totally and utterly blows all the NTSC letterboxed films out of the water in the quality department. They don't even come close. The crispness of a lot of the scenes was fantastic, the level of detail on screen is always high, with lots of the finer detail still being clear. Colours looked great at all times. The only fault I can really come up with is that in a few scenes a little bit of granyness was noticable, and there was the odd bit of speckling. That aside, this is a top notch print. The Film Four DVD for Brother comes with an inlay card which has a written biography type thing on Takeshi Kitano, which is a nice start to things. But with a top notch transfer, and great audio and subtitles, you can't really expect much as far as the extras go can you? I mean something has to be less than very good. Well not in this case. There are a good few extras which will keep you interested and educated. First off there is the film's trailer. Next there is a short 2 minute Featurette, which just contains general comments from the cast and crew. Next up is the biggie in the extras department. It is entitled, "Scenes By The Seas - Life & Work Of 'Beat' Takeshi Kitano", and clocks in at 48 minutes in duration. I'll be honest, I haven't watched it all due to time issues, but the first 10 or so minutes which I did watch were very interesting, and I wish I had the time to watch the rest. Next there are about 14 minutes worth of interviews with the Cast and Crew. Speaking to the camera are Takeshi Kitano, Masayuki Mori (producer), Jeremy Thomas (producer) and Omar Epps. Each comment about their involvement in the film and other topics, and is another good watch. All Japanese speech is subtitled in English in this. Lastly there is an On Location segement which is just a look at some scenes being prepared for being filmed. The Japanese that is spoken in this is not subtitled. All in all, there is a good amount of extras, more than most single disc dvds anyway! What makes it more incredible is the price of the DVD. This film can be found for about �5 at amazon.co.uk (linked above after synopsis) and the DVD really does mock that price! 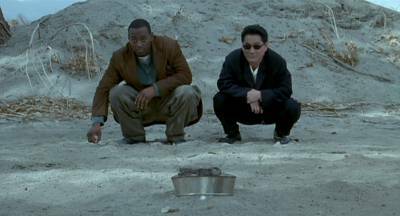 Brother is a very competent film, not that you'd expect less from Takeshi Kitano, and is a good watch. At the end I was left satisfied with what I had seen, but I did find the sort of haphazardness of the scenes in the film to be a little off putting on retrospective. If there had maybe been a bit more linking some elements of the film together, the film would have scored higher than it does. I'll admit I've not seen many films which Takeshi Kitano has directed, so maybe that is just his style of film-making, but until I get used to it and maybe appreciate it a bit more, it is going to be a drawback until then. 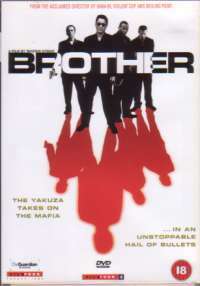 As far as Yakuza films go, Brother is a good change in bringing it to the US, and is definitely worth seeing.